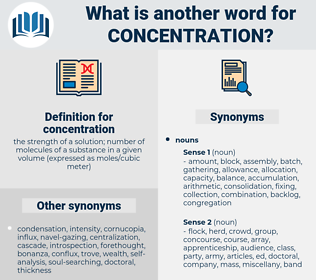 What is another word for concentration? Associations, groupings, Recipes, groups, Concentrating, concentrated. aggregation, density, accumulation, gathering, Concentrating, build-up, specialization, detention, transaction, rally, co-location, specialisation, Pooling, agglomeration, CONC, operation, target, dose, contraction, Massing, refocusing, orientation, convergence, dedication, enrichment, percentage, reunification, tenor, toxicity, priority, grouping, regroupment, arrest, combination. centralisation, centralization, concentrate, concentrates, consolidation, proportion, Centralism, quantity, strength. division, scattering, parting, dispersal, severance, separation. confusion, inattention, unconsciousness, abstractedness, detachment, abstraction, indifference, mindlessness, befuddlement, bewilderment, unconcern, bemusement, unawareness, withdrawal, disinterest, absence, distraction, remoteness, absentmindedness, obliviousness. Competition is seriously limited today in many industries by the concentration of economic power and other elements of monopoly. She regarded the flowers with grave concentration. hydrogen ion concentration, titer, molar concentration, molarity, titre, molal concentration, molality, M.
compaction, concretion, densification, rarefaction, compression.